Have you been wanting to try the concretes or shakes at the new Midtown Shake Shack (on 44th & 8th), but didn’t want to wait in the crazy lunchtime line? Good news for you! It looks like they’ve added a “C line” to the Times Square location. Eric, the luncher who was kind enough to send us this photo of the new sign, was concerned that this might be a weekend only kind of thing… but we’re going to assume hope that it’s permanent. 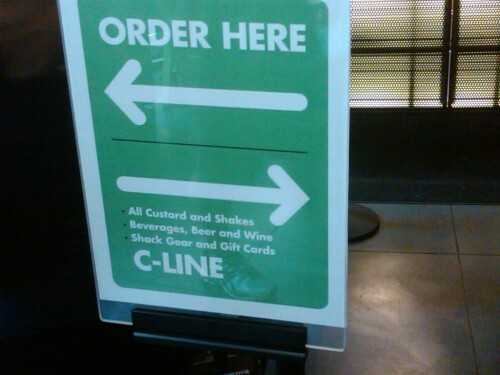 Posted by The ML Team at 9:30 am, August 2nd, 2010 under Shake Shack. I had been wanting to try the donut concrete but was unwilling to wait in the full line just for that (not being a fan of the shack burgers…I know! I know!). Anyway, I was walking by last night and decided to see if they had added a C Line. Very happy to see that they had – and that it was empty. Got a few evil looks from the people at the front of the A line when the cashier turned to me instead of them. It still took them a good 10 minutes to prepare the 2 concretes I ordered, but I guess that’s better than waiting an hour +. do they have a B line? A & C because those are the trains that stop there. I believe C stands for Custard, no? Who can name that movie? I think B is reserved for the original one-where there’s a B line. Oh, I went on Friday night around 6pm after work because I really wanted a burger and custard (Mud Pie!). Line moved quick and took me about 15 mins to place my order, then I got my food in less than ten minutes. Good job, new SS! I hope they stay on top of things. AHHhhh — smart capitalists at their best. It is VERY important to herd the hungry hoards into the proper channel so that they may be fed and that we may be able to fill our coffers faster and with less stress and duress. Nothing wrong with that strategy, for sure.